Think about your team members’ “work experience” daily. Successful restaurants and foodservice operations around the world are a complicated mix of guests, team members, products and busy hectic environments. Operators face difficult daily decisions just to stay in business. Employee retention (lowering turnover) has been identified as a crucial component of the management success formula. In everyone’s book it is just as important as brand, sales and profits. During 2006 it will not get any easier. If you want to retain workers, lower costs and provide a great team member experience you must reduce and eliminate worker injuries. I have always been a proponent of “fun” in the workplace because it assists in creating a good environment for team members and that positive energy flows to the guest’s brand experience. A precursor to fun however is safety. As a worldwide industry we usually offer young people an entry-level position and much of the time, a first job. Operators should view the hire of a first-time job candidate with a high degree of responsibility. We owe it to them to provide a safe and healthy environment to learn the necessary job skills of the industry. A proven strategy for preventing and reducing job injuries is safety training for team members. A regularly scheduled meeting for safety and health training will educate them on workplace hazards and how to prevent them. This also fits seamlessly with becoming the “employer of choice” in your marketplace. The challenging and competitive marketplace forces operators to source, select, hire and train team members as quickly as possible. With the real world pressures of profits, budgets and growth, safety is one topic that gets little focus or attention. Management or trainers often do not even mention the word safety. The restaurant workplace contains many of the ingredients and contributing factors for injuries. This won’t surprise anyone in the industry. So how does an operator or company protect its team members and guests? And in today’s litigious world, what does management need to do to protect the organization and shareholders? Involve team members in the process to improve workplace safety. Teach and train team members to identify safety hazards and have a process in place for reporting unsafe conditions to the responsible management person. Owners and management must be willing to make necessary changes or improvements. Preparing and developing a restaurant safety program is usually not one of the top items on the daily to do list at a restaurant. So where do you start if you want to provide a safe work place for team members and guests? Where and how do you find information? What resources are available to assist you in preparing a safety program that will meet requirements and be an asset to your organization? My first step was to do an on-line search of workplace safety related information. In North America, start with your state or provincial government and review the online listings of resources that are available. The governmental authorities in your county or municipality will have laws and legal requirements for employment. Some will have training that is required by law depending on the type of job function or type of facility, number or employees, or size of company. The age of employees performing specific jobs or operating certain types of equipment is an important consideration. California has a web page: http://www.dir.ca.gov. Many state or provincial government web sites provide this type of listing. Take some time to review the information and become familiar with the topic. These sites can quickly provide you with a tremendous number of links and information. Try not to become overwhelmed. Check with the restaurant association; they may have safety assistance links on their website. The next step is to contact your insurance company; some provide you with resources to prepare your own safety program. Available materials include safety program outlines, manuals, posters and seminars. The Labor Occupational Health Program at the University of California, Berkeley, developed the Restaurant Supervisor Safety Training Program (http://www.dir.ca. gov/CHSWC/English_Trainers_Guide.pdf) with funding from the Commission on Health and Safety, Worker’s Compensation and the State Compensation Insurance Fund. Ms. Bush assisted in developing the Restaurant Supervisor Safety Training program and materials. These organizations encourage you to review and use this type of safety training program. A similar program used in restaurants in the state of Washington resulted in a 20 percent decrease in injuries and illnesses on the job over a two-year period. A guide for conducting a one-hour safety workshop or series of safety meetings with team members. Tip sheets can be used by managers to identify new protective measures safety issues to emphasize in team member training. This form can be used for new team members or for the periodic review of current team members or when a new procedure is initiated. 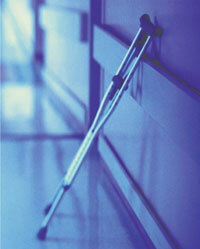 Slips and falls are a major contributor to injuries. Having a shoe policy that employers can enforce can reduce the chance of injuries. This fact sheet contains key information on health and safety and child labor laws, as well as tips for training and supervising young team members. This fact sheet provides a summary of thkinds of work teens under age of 18 are prohibited from doing under Federal & California labor laws. This sticker can be used on any type of machinery/equipment prohibited for use by teens under 18. Examples include food slicers and certain powered tools. A foodservice leader must first make the decision for the company to set safe operating conditions as an organization goal and standard. Involving your team in the process to achieve safety can then be supported with safety program training and materials. It just takes a little desire, effort and follow-up. With available safety resources, establishing a safety committee that meets bi-monthly and some leadership safety can be improved in most operations within 30 days. Set safety as a goal in 2006 and reward your team members for operating safely. It will improve your company and bottom line. Copyright © 2008 W.H.Bender & Associates. All rights reserved.